Hello family, friends, and other guests! Thanks for stopping by. I started this website during my senior year in college, so that I would always be able to keep in touch (no matter where I live or how many times I move). It has proven to be a good idea, since I have lived in seven different places over the past decade. 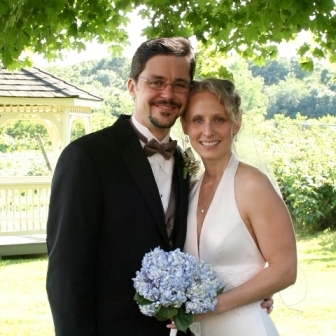 Not long ago, Stephanie and I were married at St. Francis of Assisi and hosted our reception at a historic barn on the grounds of Brooksby Farm in Peabody. We were blessed with some wonderful weather, and the presence of our family and friends for the weekend. Our wedding website can be found here. Our team in Woburn is active in developing turn-key RF Test solutions for both on-wafer and packaged parts at Skyworks Solutions. Slow and steady does indeed win the race! After 5 years of taking night classes I have finally completed my MSEE degree in Microwave Engineering at Tufts University. Outside of our high-tech world, I also enjoy playing softball and volleyball on various teams in the greater Boston area. 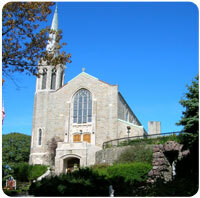 Back in 2008, Stephanie and I found the most welcoming Catholic Parish in the greater Boston area. At St. Francis of Assisi in Medford, Father Ed has inspired us to make time for God in our everyday lives. I spent six years working for Osram Sylvania in Danvers, Massachusetts. I was also fortunate to have worked as an exchange engineer for Osram GmbH in the great city of Augsburg, Germany. Augsburg is one of greatest cities dating back to The Renaissance Period. Click here to see pictures from my stay in Europe. Western New England College was recently named to "America's Best Colleges in 2008" by USNews. I have been a member of The Institute of Electrical and Electronics Engineers (IEEE) since 1994. I am also a former member of the IEEE Student Branch at Western New England College.